It was with great pleasure for the independent transport videos cameras to be invited to record the 15th Warminster Vintage Bus Running Day that took place on Sunday 9th October 2011. 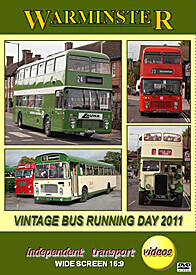 This superb event sets out to re-create the 50’s, 60’s and 70’s era of bus operation in West Wiltshire, the 2011 event is a full size one featuring almost 40 buses and coaches. This video programme will take you back to a bygone age of bus operation featuring vehicles which are firm favourites with the enthusiast and general public alike. Our day starts in Dorset, at the ‘depot’ of preserved, former Bristol Omnibus, Bristol RELL6L / ECW B50F 1257 (DAE 511K). We board the bus for the run to Warminster through the beautiful Dorset and Wiltshire countryside enjoying the sounds from its Leyland 0680 engine! On arrival at the ‘Coach Station’ in Warminster we see the buses and coaches arriving from all over the area to take up their duties for the day. Many familiar fleets are represented from days gone by. Bristol Omnibus, Wilts & Dorset, Hants & Dorset, Southern National, Western National, Southern Vectis, Bath Services to name but a few! Also from further afield – London Transport, Trent, Brighton Hove & District, Crosville and also a Bristol RE from New Zealand!! Further filming takes place at the Market Place and on Station Road at various times during the day. We have a further ride on DAE 511K to Gillingham via Mere where the Warminster Town Crier who was travelling on the bus gets off to wish the bus ‘Happy 40th Birthday.’ It was about this time in 1971 that the building of it was completed at Eastern Coach Works. Later in the day our second camera films the events at Mere where the Salisbury Street car park was turned into a busy interchange for the day. Our filming draws to a close at the ‘Coach Station’. We then board DAE 511K for the journey back to Dorset. As a bonus we have added some of the highlights from the 2010 event for your added enjoyment. We hope you enjoy this programme and we would like to express our thanks to Bob Eade and to “H&DW&D” for organising this excellent event. Duration : 105 minutes (approx).